FBTBForums.net :: View topic - Rebel Pilots? And doesn't Karie Neth's pic look like computer artwork? Yes, it does. Since the CCG can't even name a guy part of Gold Squadron at Yavin without screwin' up his ride (see Hol Okand above), I have a hard time relying on them for info of this kind. It's like they're just making it up to merchandise stuff. Hahaha- I didn't notice how old it was either. As far as reliability of the CCG goes, it's on the same level as most of the EU novels. It definitely has issues and contradictions with the films, but it does provide a lot of background info that isn't available elsewhere. I agree that Han & Chewie were more like "auxiliary" than regular military and that Ackbar et al. are in a completely different category. But pilots are pilots- the question needs to be defined more narrowly to "starfighter pilots" if we're talking A-B-X-Y operators. But pilots are pilots- the question needs to be defined more narrowly to "starfighter pilots" if we're talking A-B-X-Y operators. I don't know for sure what the original author had in mind, but that's how I interpreted it: "starfighter/smaller combat ship pilots". Decipher did advertise all its lore as being 'approved' by Lucasfilm. What exactly *that* entails, though, I have no idea. They were creating their own material fairly early on (the TIE Scout comes to mind), but they also referenced EU material accurately. I'd be curious to find out who at Lucasfilm put all of that together in that period of the 90s when the EU wasn't as established. Anyway, Decipher also did significant image cleanup and enhancement for some of its cards, which further obscures the issue. The pilot may have been on screen, but not as shown in the card. What exactly *that* entails, though, I have no idea. Yes, you are authorized to print me more money. B-Wing at BoE: again, we're left to wonder without on-screen footage, but this is generally accepted to be the helmet of B-Wing pilots...it also comes in a variant that lacks a visor (seen on Ten Numb), presumably to accommodate giant alien noggins. As Blacknight pointed out below, it is seen being worn by humanoid B-Wing pilots in the PC game, Rebel Assault 2. B-Wing at BoE: see #39 and thanks to Blacknight, this shot. Red 9 and 11 check in off camera. This guy's first and last line, "I'm hit!" is uttered just as his tail gets waxed by one of Vader's wingmen. 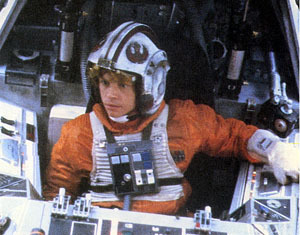 He never identifies himself on screen, but appears to be flying with Red Squadron in an X-Wing. If you ask me, he looks an awful lot like actor Jack Klaff who is actually credited for the role of Red 4 (John "D"). This X-Wing pilot checks in as "Red 10" on screen. He's presumably taken out by Darth Vader's TIE, but after the suspenseful build-up to his on screen death, the actual in-cockpit explosion that follows his line "I can't hold them" features this other guy and/or helmet. This guy = Gold Leader (it can reasonably be inferred that this guy is either the Tiree or Hutch referred to later by Gold 5). According to the end credits, Gold Leader is played by Angus McInnis. This Y-Wing pilot never identifies himself on camera (it can be reasonably inferred that this guy is either the Tiree or Hutch referred to later by Gold 5). Though this pilot never identifies himself on screen, he does look a lot like Jeremy Sinden who is credited as Gold 2 in the end credits. This Y-Wing pilot's voice responds off camera to Gold Leader's query: "How many guns d'ya think Gold 5?" After his 2 wingmen are felled by Vader in his TIE Advanced, he identifies himself on screen to Red Leader as "Gold 5" when reporting "...lost Tiree, lost Hutch" (source = subtitles of Episode IV SE). His callsign was very briefly changed to Gold Leader based on Red Leader's response to this news: "Copy that, Gold Leader." Seconds after this, Gold 5/Leader is hit by a green laser blast from what appears to be one of the 3 pursuing TIEs. According to the end credits, Gold 5 is played by Graham Ashley. Maybe just mention there are visor and visor-less variants of the B-wing helmet design (which, like the a-wing "helmet", is basically just a pair of giant headphones over top of a WW2 era flight cap). Regarding Y-wing chest boxes, I've read some people surmize that their "chest boxes" are different from the others in that they are actually more like heavy FLAK/armor vests (like B-17 gunners used to wear), which makes sense because they are bomber pilots who are exposed to a lot of fire in their slow craft. But he's kind of an anomaly. Aren't RotJ pilots just a fascinatingly obscure subject? I think so. Well, you know I'm a total geek about it. Nice points, Blacknight. Apparently there is some variation in the B-Wing helmet, but those two you linked two definitely seem to be derived from the same basic helmet. Maybe there are different versions to accommodate different head types (Mon Cal, Sullustan, etc.). Thanks for those screens of the red and blue pilots walking. I distinctly remember seeing that scene last time I looked into this...one guy walks off screen from left to right only to return from right to left with a buddy a few seconds later. I think we're dealing with a "throw some more pilots in the background" situation here given the B-Wing uniform with X-Wing helmet and the unique blue suit...though, if you want to apply that to the fiction of SW, we are dealing with the rag-tag Rebellion here. It's not like they'd keep a B-Wing unmanned because the pilot couldn't find the right helmet. There is a possibility that there are two variants, or it could be a case that Ten needed a different helmet design since he wasn't human. Going on that point it's entirely possible that he is the only one that actually used that helmet. On the second pic, I'm not sure how reliable it is. From what I can understand of the Rebel Assualt 2 game, they simply took props from the movies and used them for the live action shots. To further this point in one of the earlier cutscenes they depict an X-Wing pilot wearing a X-Wing flight suit with a Y-Wing helmet or is that an A-Wing helmet. In a cutscene later they have X-Wing pilots flying B-Wings. I'm not saying that those aren't B-Wing helmets. I'm simply saying that might not be a variant and just some weird thing the studio did when shooting. Good point guys, maybe it was just an exclusive to Ten (who wasn't even in the movie in that white jumpsuit!). I agree Rebel Assault 2 is not a flawless reference by any means. The thing that made me think the visor-less helmet was more correct is its similarity (without the visor) to the the A-wing helmet, as though maybe the Rebellion was shifting to that type of helmet design. Also, the one with the visor would be the only full face visor design (covering the mouth) worn by any pilot in the rebellion, which seems a bit odd IMO. However, it could be possible that because the B-wing is designed to attack capital ships and whatnot, then the B-wing pilots wanted mouth protection the same way as the Y-wing pilots wanted those protective FLAK vests I mentioned earlier. Lucas REALLY should have edited a couple of B-wing cockpit scenes back into the special edition of RotJ to resolve this.